AirPods, Apple’s latest foray into Bluetooth audio. I’ve had a life long addiction to gadgets. And I’ve had several Bluetooth headsets. For exercise: a few from the same line as the Motorola S10-HD (pros: they stay put while I run and they don’t break from my sweat; cons: extremely uncomfortable and mediocre sound). For other things: several different LG neckbuds (pros: decent sound, comfortable; cons: uncomfortable in bed and make you look like an a**hole). More recently for exercise: cheap TaoTronics (pros: cheap and light; cons: awkward because heavier on one side, need to constantly adjust while running). So when I saw the AirPods announcement I knew I wanted them, but I didn’t know that I wanted them $160 bad. Regardless, when the preordering system went live, I set up an alarm to place the order… I can always cancel before they ship, right? A few weeks later, I got an email saying they are about to ship and they’d arrive on… the same day I’m leaving to Mexico for two weeks. I knew I didn’t want them to sitting outside my door for two weeks. I had to cancel even though at this point I did want them. At this point the thing is backordered 3 months. In Monterrey I went to the local mall. 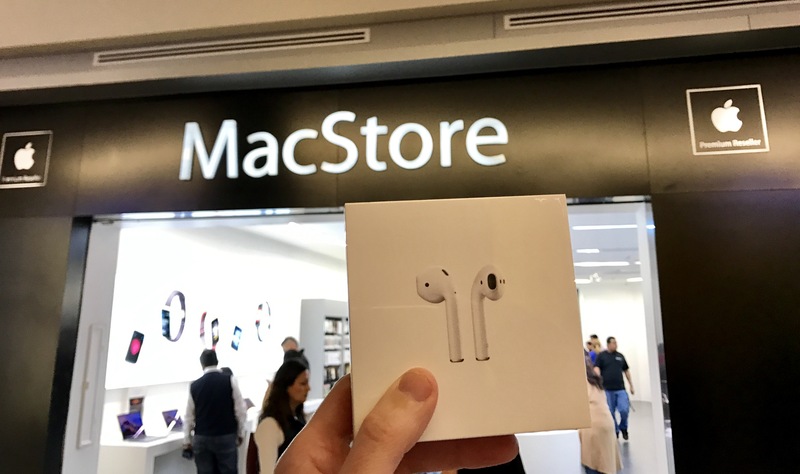 As I’m walking by the MacStore I casually ask if they had them in stock. What do you know? Score! They had 10 units (should have bought more for Craigslisting) at the same price as in the U.S. These things are slick. The case has a nice feel to it with a solid magnetic latch. As expected, the packaging is nice. You first take them out of the box, open the case, and boom! a little popup on my iPhone comes up asking me to pair. I did not have to wait several seconds, press any buttons, go into Bluetooth Settings, look at spinning wheels. Nothing. It just worked. This is light years ahead compared to any other Bluetooth pairing experience. Someone finally got it right. Even cooler, once I paired with my phone, the things just started showing up on my list of Airplay speakers on my iPad, Mac, and even watch. If I want to switch which device I’m listening to, I just have to select it from the device itself. This compares with my other Bluetooth headsets for which I need to put them in pairing mode and go to Bluetooth Settings and select them every single time. Death by a thousand paper cuts. Without doing comprehensive side-by-side testing, they appear to be comparable if not a little better than Apple’s EarPods which I think are perfectly adequate for most uses. They sound better than any of my previous Bluetooth headphones. The microphone also seems to be very high quality in my limited testing, and it works well in noisy environments. So, not audiophile quality but perfect for casual listening. One of the worries I had is that they’d keep falling off. They don’t. These things are very light, and since there’s no cable adding weight or tugging, they stay put. They are very comfortable, but maybe my ears just happened to be perfectly shaped for them. If you like the headphones that came with your recent iPhone, then you’ll like these. Added plus: listening in bed is great. With neckbuds you have the pillow pushing the thing to your neck and the blinking light distracting you in the dark. None of that here. Another thing I really like is that the case is smaller than expected, so you can keep them in your pocket. This was not really possible with any of the Bluetooth headphones I had before. Yet another little but really useful perk. The controls are very limited. You can double tap to bring up Siri (configurable to Play/Pause in the iPhone settings). You take one out while listening and it pauses, put it back on and it continues (cool!). But that’s it. If you want volume control, next/previous, or anything else you need to go to the phone. Or, if you have an Apple Watch you can go to the Now Playing Dock Item. This is actually very convenient and it shows that the more money you sink into the Apple ecosystem, the better things work together… but then you’re bankrupt. I wish there were better controls, even if they are better voice commands. This is the biggest drawback with AirPods so far. I’ll stick with my cheap TaoTronics. I don’t like the prospects of a $70 tiny AirPod flying off my ear or my pig-like sweat drenching them dead. Maybe one day they can use the little speaker to push water out. These are the best wireless headphones I’ve owned. That’s good, because they are also the most expensive. I’m taking them to work every day and I don’t look horrendously goofier than usual. You didn’t mentioned if they are adequate for all type of ears. If you send me a silicon mold of your ears (http://www.officedepot.com/a/products/890077/Castin-Craft-Mold-Builder-Liquid-Rubber/) I will treasure them forever, and even check how well the headphones fit. Please print me a 3D model of Amit’s ear. I want to put it on my shelf.